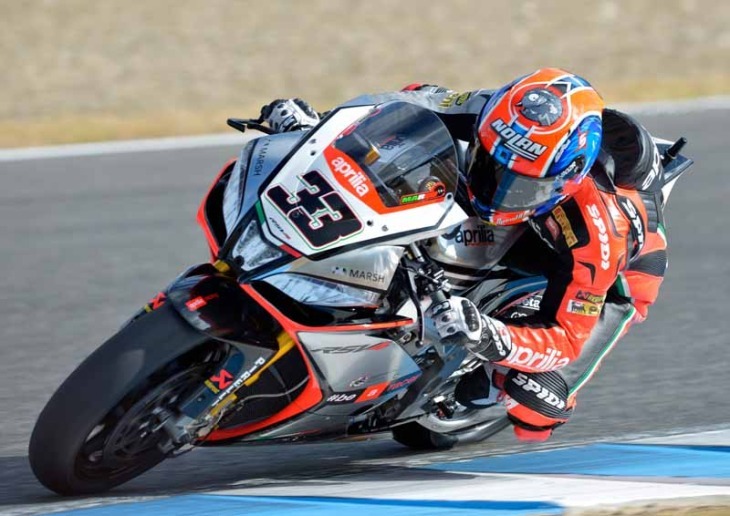 Jerez de la Frontera (Spain), 6 September 2014 – After dominating the practice sessions and setting he best time in both qualifying and free practice on Saturday morning, Marco Melandri finished fourth this afternoon in Superpole, the decisive session that defines the order on the starting grid. This means that the rider from Ravenna will start from the second row of the grid astride his silver RSV4. A couple uncertainties and Barrier’s crash right in front of him as he was making a play for the front row compromised his time, but they did not affect his ambition for victory, especially considering the excellent race pace and consistency demonstrated from the start of the weekend. “I made a couple of mistakes in the first part of the track with the qualifier mounted and then in turn 6 Barrier crashed in front of me so I lost a bit of confidence. In the second lap the tyre had lost some efficiency so I wasn’t able to improve. I’m sure I lost a few tenths of a second. In any case, compared to the other rounds this was a good Superpole, especially because I was able to get even closer to the front runners. Getting off to a good start will be important tomorrow. Jerez is a track where it isn’t hard to overtake so the second row with a good pace is just fine”. Sylvain Guintoli, who is holding out his hopes for the championship on the eve of the Spanish races, given his current second place in the standings, also encountered a few uncertainties in Superpole. However, the second row is still a good placement which puts him among the contenders in Sunday’s race, especially if Sylvain and his team are able to recover a few tenths in race pace during the warm up session tomorrow morning. “We have worked a lot over these two days but there is still something missing. In any case we are all very close, so it will be important to make the right choices for the races tomorrow. We’ll use the warm up session to try something different in the hopes of improving our pace. I haven’t planned out a strategy. The important thing at the moment is shaving off a little more in the warm up session”. Giugliano and the Ducati Superbike Team to line up on the front row of tomorrow’s grid at Jerez!